Here’s what’s happening, at least what I’m planning to happen during November. We will be reading many Thanksgiving themed books. Here are a few of my favorites. Students love this interactive pop-up book. I try not to hold it too far away as little hands always want to reach out and touch! The bright photographs in this book, always get students talking. I can’t get through this books without some good discussion, which is a good thing! Who doesn’t love a book with a little suspense? This is always a crowd pleaser with the students. This catchy sing-song book is perfect for targeting vocabulary. The repetitive simple text makes this book the perfect book for expanding language. Of course we can’t have Thanksgiving without Granny! We will also be reading a new book, that I hope becomes a new favorite with the students. It’s called Turkey, Turkey What Will You Eat? This is a fun, interactive reader that will target vocabulary, answering “wh” questions and using future tense. 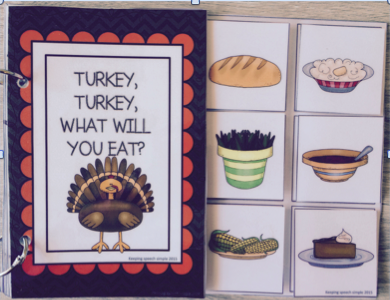 You can find this book, as well as some other fun Thanksgiving Activities in my new product on Teachers Pay Teachers. We will be playing Thanksgiving Bingo, which is also available in my Thanksgiving product. We will also be using other activities from the product that will help us to target spatial concepts, pronouns and possessives. 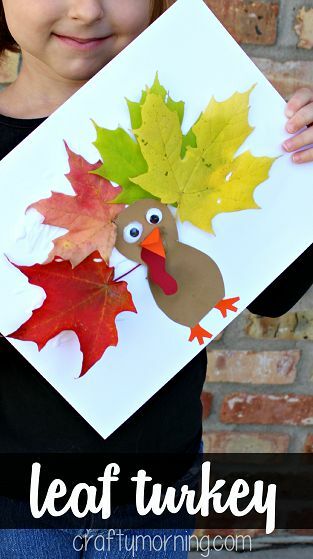 As far as crafts, I think it will be fun to make these leaf turkeys. We will also break out the dish washing brushes to paint the feathers on these cute turkeys! In our class meetings we will be watching more teamwork videos. We will also be continuing our class activities that help promote participation, cooperation, listening, communicating, patience and body awareness. Even though Halloween has passed, we haven’t had a chance to play the Name Web with all of our groups, so that will continue into November. This is the plan. Hopefully we get to everything as well as some other activities that develop over the next few weeks!